Several cases were optional in the late 60's. This section of the site is dedicated to properly identifying the period correct case for a LSLP. 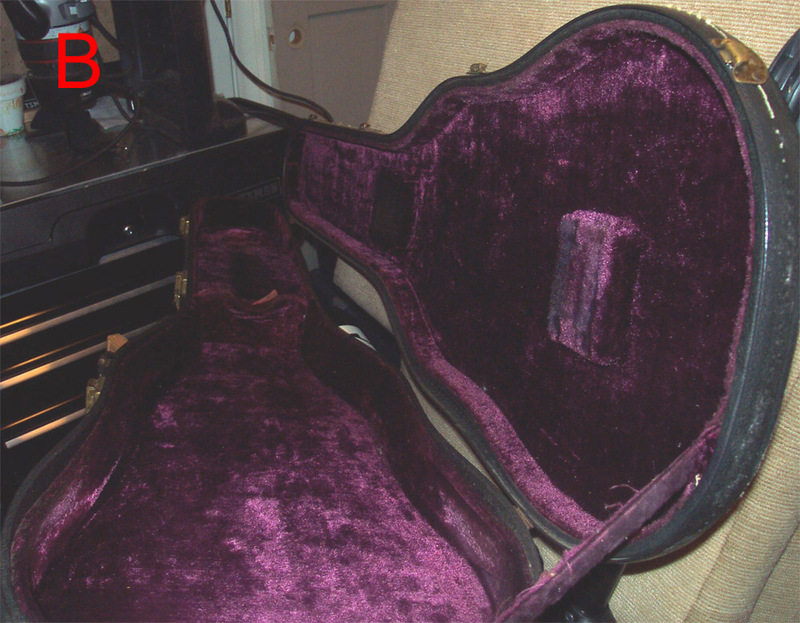 Customers were given choices of whether they wanted a shaped case, a rectangle case, or no case when purchasing guitars in this era. How does that matter now? Consider this example: A customer buys a Les Paul Custom that shipped in a rectangular case in November of 1969. Given the choice of a rectangle case or the more expensive shaped case, the customer goes with the shaped case the store has sitting unsold on its shelf. It's an early, 50's style, and orange lined case. 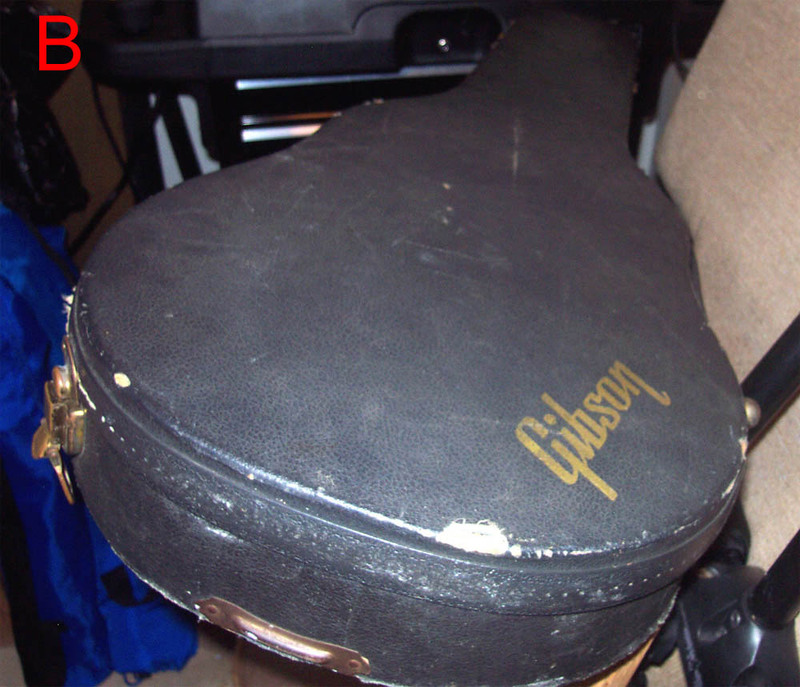 See how a case made a year before this guitar can still be "original"? 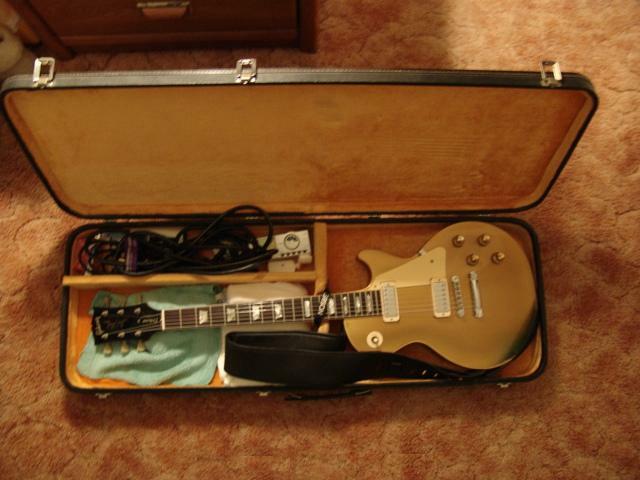 What if a '68 Goldtop didn't sell for a couple years and left a shop with a purple, 70's case? This is just a speculative situation, but I hope you get the idea. 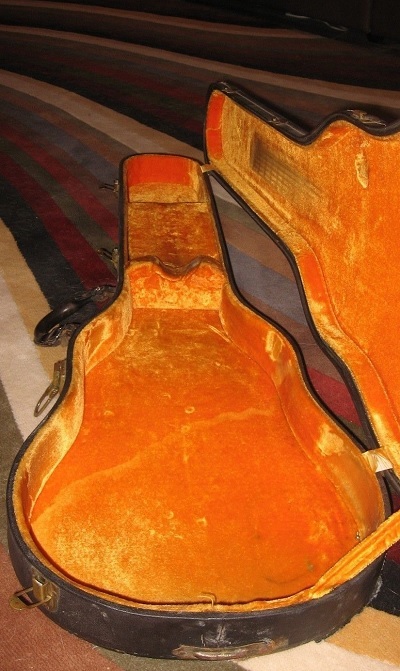 Basically, any of these cases could be original to almost any guitar from the era. 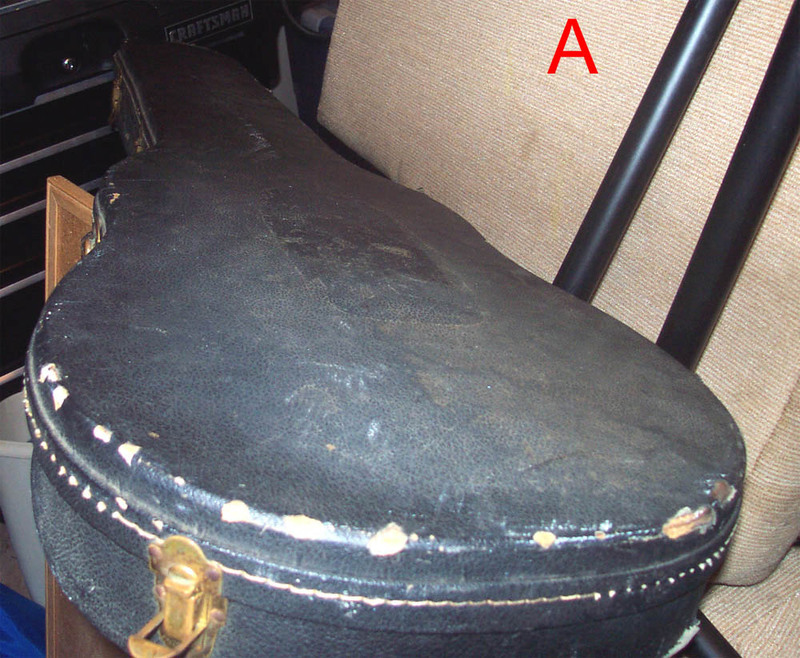 My guidelines (educated guesses really) are based on cases that appear to be the ones the guitar left the store with. It's all a bit grey. A period document called the "Suggested Retail Price" list became effective June 1, 1968. In it, it lists some useful information about the two cases available for the reintroduction of the Les Paul Custom and the Les Paul Standard. You can see it and other documents at the "Period Literature" section of this page. There were two cases available initially: the "Oblong Shape" case and the more expensive "Faultless Case". "Model 0535, Faultess Case (Plush)"
1968 Retail price: $73.00 --> $475.22 in 2012 dollars! 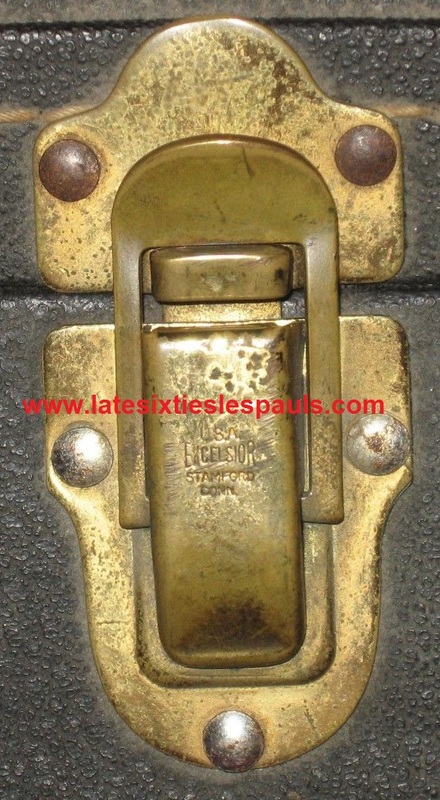 "Bruce" Handle & Excelsior Latch from A1 Case, 559xxx. 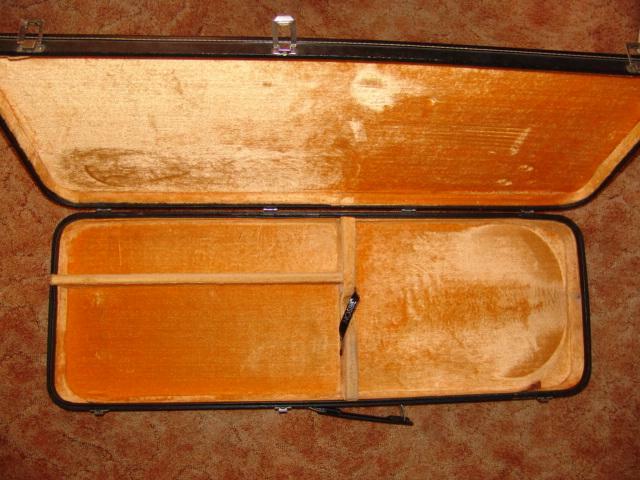 This was the most expensive case back in the day at nearly 50% more expensive than the economy, "Oblong Case". It is also the most rare and expensive one today. 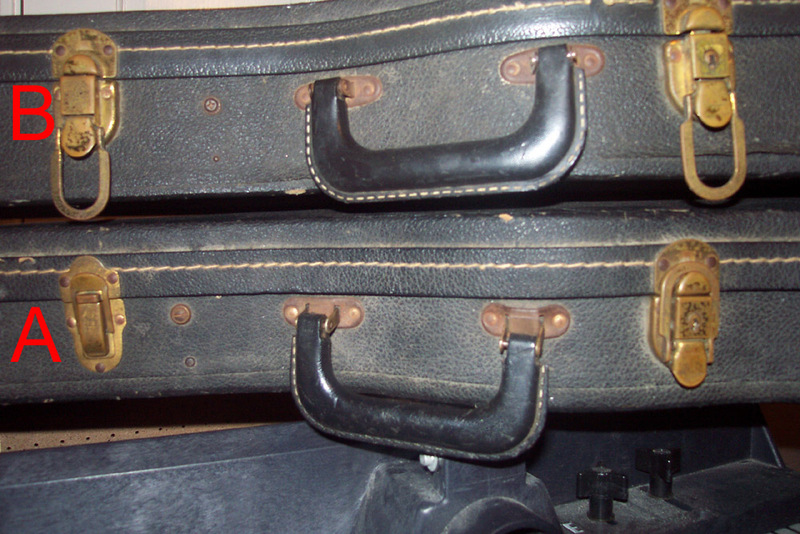 It is very similar to the orange-lined cases from the 50's, although I have not done a direct comparison. There were three types that span from June of 1968 through early 1970. To make discussing them easier, it is useful to refer to them as versions: A1, A2, & B. The earliest variant, known here as Version A1, has no exterior logo, 50's style latches, and one modern, locking latch. 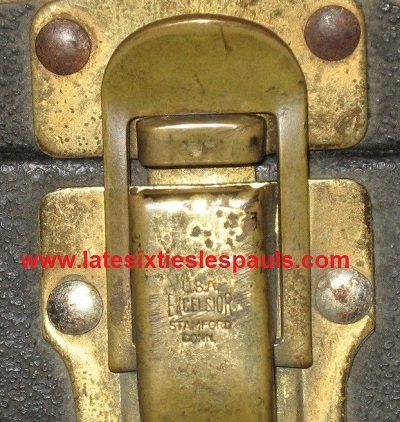 The 50's style latches were made by Excelsior in Stamford, CT, USA. 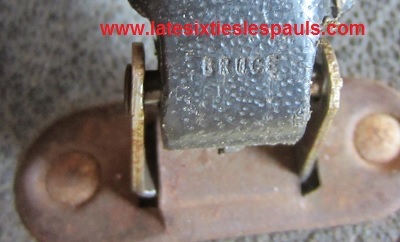 Original handles, at least for the 559xxx era A1 case, will have "Bruce" stamped into the base of the handle as shown here in an image. 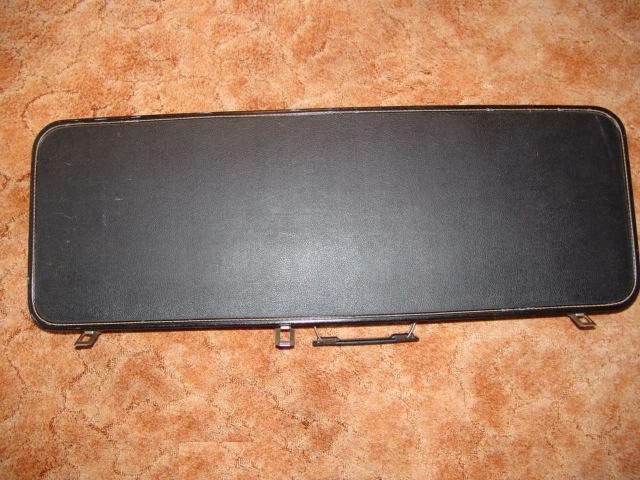 My A1 case is definitely original to my early April 1969, 559xxx guitar. The A1 variant was phased out in favor of A2. This change most likely occurred in mid-1969, but there is no way to confirm this estimation. 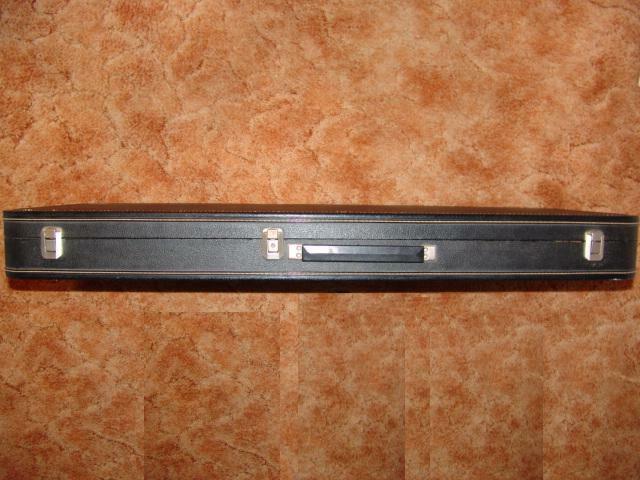 A2 cases are basically identical to A1 save that they have modern-style latches in all positions. One of which is locking. A2 is not picture on this site. Infrequently, I have observed a few A2's with supplementary padding, but they possibly may have originally been for thin-bodied SG's. Version B is different than the A-Series in multiple ways. It has an exterior, gold painted "Gibson" logo. It is lined in very dark purple material. It has supplementary padding inside to better help protect the guitar. The earlier "A" variants are notoriously bad at doing so. Version B has the same latch setup as A2. 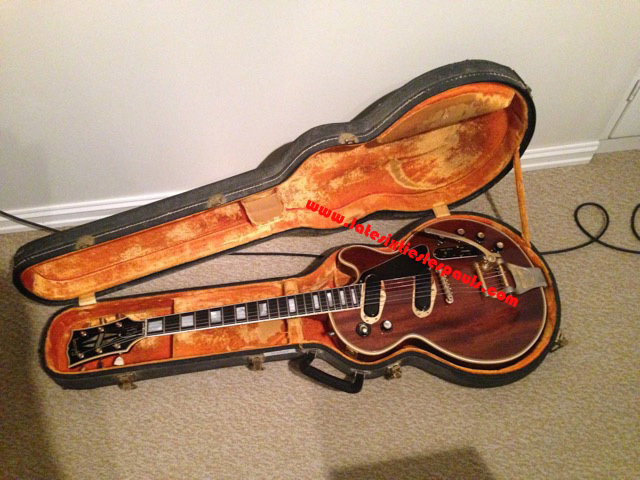 I believe the purple-lined case to be from VERY late 69 or early 1970,possibly beginning around the 89xxxx series. Being honest, it is possible that this case is technically an early 1970 invention. 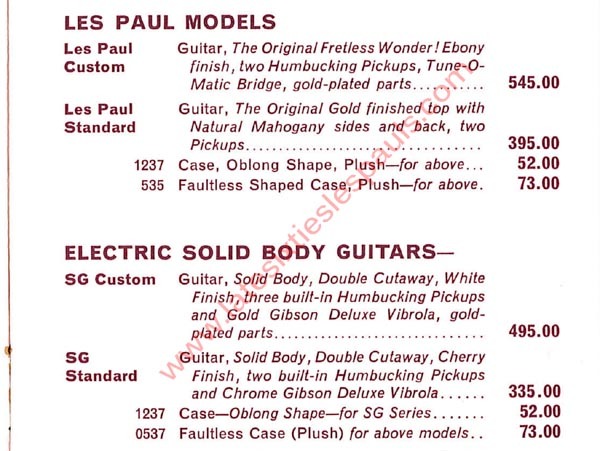 As I state earlier on this page, it is very difficult to determine which cases shipped with which guitars. Also note, I have only confirmed the "Faultless" name from 1968 literature, so it may only refer to the orange lined examples in the A series and not the purple Version B's. Clean, early, and orange-lined examples with 50's style latches brought a couple hundred dollars in late 2005. By 2011, they were bringing $400-$800 depending heavily on condition. Orange lined. Known as the "Model 0535, Faultess Case (Plush)". 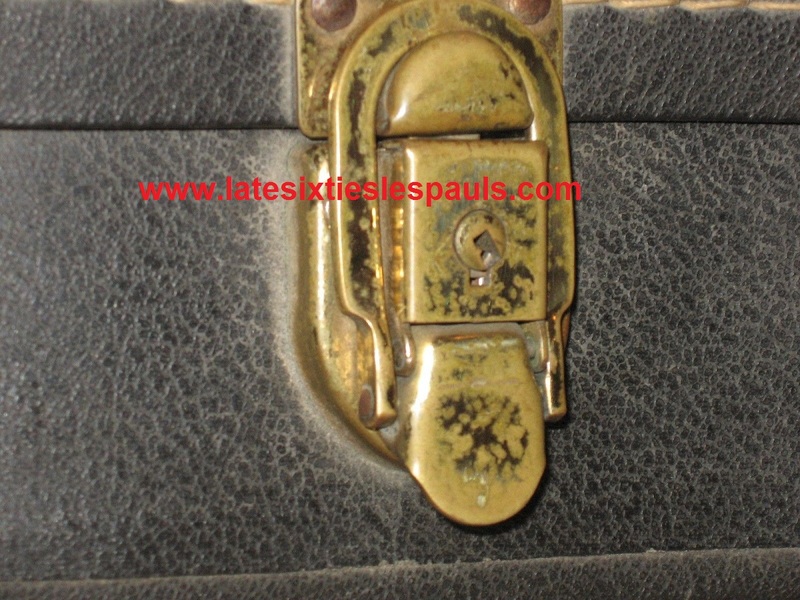 This variant has 50's, Excelsior brand latches and one locking latch. The earliest shaped case. No Gibson logo. Purple lined. This variant has all modern latches (one locking). Gold Gibson logo. 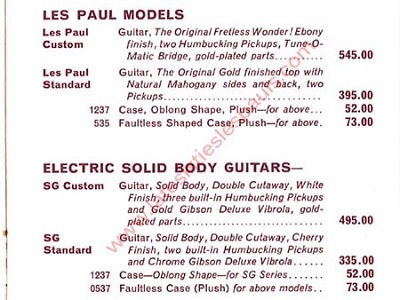 Most likely correct for VERY late 1969 guitars with serials of 89xxxx and above. Possibly incorrect for 1969 though. Possibly early 1970. "Model 1237, Oblong Shape, (Plush)"
1968 Retail price: $52.00 --> $338.52 in 2012 dollars! This case was introduced alongside the Faultless case back in 1968. Amazingly when you adjust for inflation, this "economy case" retailed for $338.52 in today's money! (circa 2012) They still sell for a good chunk of change these days, although not quite approaching the price of the orange lined, shaped models. They have a black leather strap with a Gibson logo to retain the guitar around the 12th fret. Oblong cases were available from June 1, 1968 and are correct for all LSLP's. 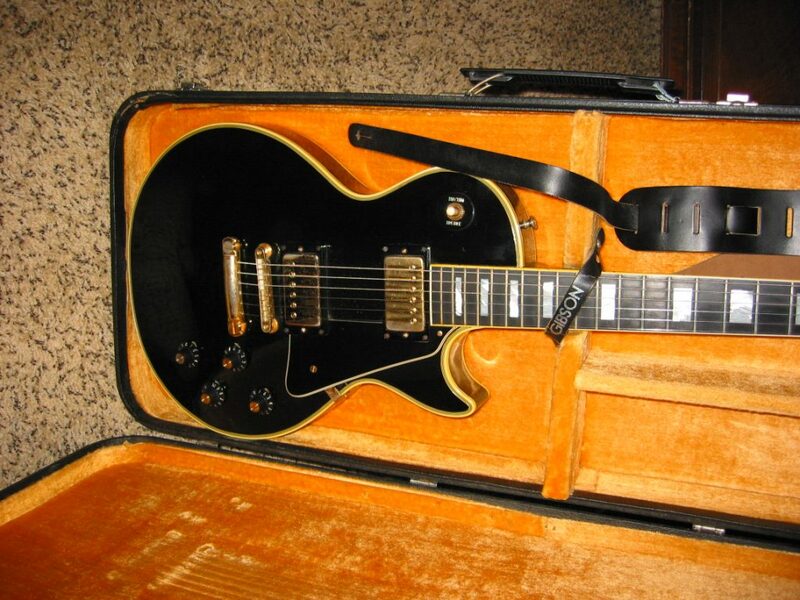 It is unclear when Gibson discontinued this design as one does not see them into 1970's at all. 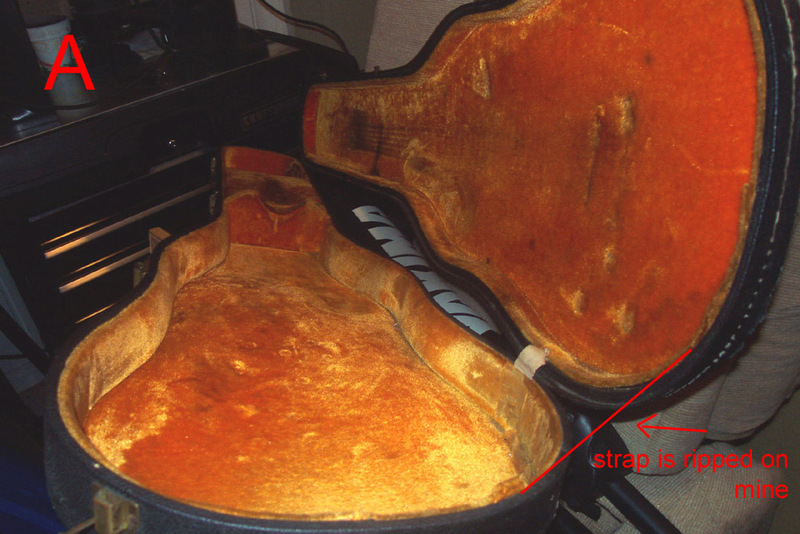 Note, there is a variant which had curved, padded inserts around the body. I have only seen one or two of them. All variants are orange lined. Photo Courtesy of T. Røyseth of Norway. Recently a kind gentleman out of Norway sent me pictures of his killer, very early LP Personal. I noticed right away that the case was something I had not seen before. Note the special pad built into it. My period literature does not list a separate case model number for the Personal and Professional models, but here is a picture of one "in the flesh". Good luck finding one if you need it for your guitar. I cannot imagine how rare an orange lined one would be. Thanks again, Mr. Røyseth!